Introduction; Part I. The Role of Oratory in Roman Politics: 1. Oratorical settings and career possibilities; 2. Other routes to political success; Part II. Themes and Oratorical Careers: 3. Tribunician oratory and family inheritance: Gaius Gracchus' political career; 4. Politics behind the scenes: Pompeius' oratory and political career; 5. The oratorical springboard: Caesar's political career; 6. The oratory and career of Piso Caesoninus; 7. Powerful profiling: Cato the Younger and the impact of self-presentation; 8. Career-making in a time of crisis: Marcus Antonius' oratory; Conclusion: towards a new Brutus; Appendix 1. Gaius Gracchus' public speeches; Appendix 2. Pompius' public speeches; Appendix 3. Caesar's public speeches; Appendix 4. Piso's public speeches; Appendix 5. Cato's public speeches; Appendix 6. Marcus Antonius' public speeches. Henriette van der Blom is Lecturer in Ancient History at the University of Birmingham. 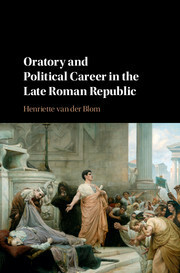 An expert in the fields of Roman republican history, politics and oratory, her research focuses on political life, the ways in which Roman politicians presented themselves to the public and the complex role of oratory in politics. She is involved in a project to collect, translate and comment on the surviving fragments of all non-Ciceronian oratory from the republican period, and she has previously published Cicero's Role Models: The Political Strategy of a Newcomer (2010) and Community and Communication: Oratory and Politics in Republican Rome (edited with C. Steel; 2013).